The Zojirushi NS-ZCC10 is the #1 bestselling 5.5 cup rice cooker. As you probably know, recently I moved to Japan and bought a Panasonic 3 cup rice cooker. Someday I will be going back home, though, and I will probably buy the Zojirushi NS-ZCC10 rice cooker before I leave Japan. First of all, hundreds of satisfied Amazon customers cannot be wrong. If a person likes something so much that they take the time to log back in their Amazon accounts to post a product review, that tells me something about how good or how bad the product is. In fact, this is the bestselling rice cooker at Amazon, and I think there are good reasons for it. Most households in countries where rice is a staple food own an electric rice cooker, no matter if the model is simple or has many features. The thing is: preparing rice should not be that hard, but it is. However, it is a very repetitive process, and engineers have found a way to automate it. This rice cooker is very simple to operate, so you do not have to be afraid of doing things wrong. This Zojirushi 5.5-cup rice cooker is one of the most advanced rice cookers in the market today. No more undercooked or burnt rice batches in your household after you buy this cooker! The Neuro Fuzzy logic technology makes several automatic adjustments throughout the cooking process, miming an actual person watching the cooking process. This way, not only you will eat consistently fluffy, warm rice, but you also have more free time in the kitchen. Multi-Menu Selections. This rice cooker is very versatile. The Multi-menu selections allow you to make much more than just rice. You are probably aware that you can prepare white rice and brown rice with a rice cooker. 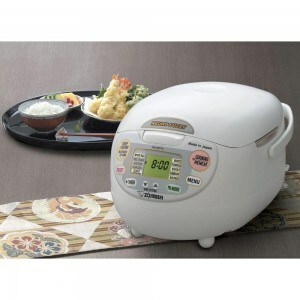 The Zojirushi NS-ZCC10 rice cooker also allows you to prepare many other foods with it. You can use it as a modified crock-pot. You can make soups, porridge, oatmeal and much more. Automatic Keep-Warm Feature. This Zojirushi rice cooker will switch automatically into Keep Warm mode, keeping your rice at just the right temperature for consumption. This is a good feature for two occasions. First, if your guests or your family is late for dinner. Moreover, second, if you leave the kitchen and don’t hear the cooker buzz indicating the rice is done, the machine will also go into Keep Warm mode. This is why you will never eat burnt rice again, even if you get distracted. Extended Keep-Warm Feature. Plus, it does not make much of a difference if people are delayed for 15 minutes or a couple of hours. This rice cooker keeps your rice warm for longer periods as well, while the rice will stay as fresh as if it had just been made. One of the many pros that I’ve noticed with this rice cooker is that you do not have to worry about your rice getting burnt or browned at the bottom (especially when you forget to unplug it). The NS-ZCC10 will keep the rice warm and ready for you when it is done cooking it. Also, there is an LCD clock and timer, which is very useful, because you do not have to remember that you have to cook the rice half an hour before eating! Also, if you are a busy person, you can program it in the morning, and when you get back from work, your rice will be fresh and ready for you! I also want to add that it does an incredible job with brown rice. Many people are having a hard time with brown rice because it is quite difficult to cook, but with this Zojirushi Rice Cooker here, cooking brown rice is very easy. Mr. Thomas Tweedel has updated his product review after 7 years of daily use, and he reported: “It’s now six years later and countless batches of rice and this little thing is still going strong. The pot has a few scratches from years of continuous daily use, but it is holding up.”Other people report having problems with the internal battery, although its estimated life is four years. If you want to prolong its life, just keep the unit plugged in. The cooker can work without the battery, though: all it does is to run the clock when the cooker is unplugged. 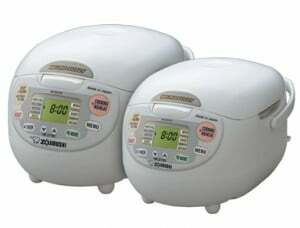 Where Can You Buy The Zojirushi NS-ZCC10 5.5-Cup Neuro Fuzzy Rice Cooker? Although the price is quite high, I must say that it is worth every penny! You can buy this rice cooker from Amazon. At the moment, they offer a hefty discount, the best deal I could find when comparing prices with other online merchants. Where Can Read More Reviews For The Zojirushi NS-ZCC10 5.5-Cup Neuro Fuzzy Rice Cooker? The place where you can find the most reviews from actual owners is Amazon. To finish with the pro’s, I’d like to add that there is a retractable cord, some recipes are included with the equipment, and it is very easy to clean. One annoying thing, though, is that comparing to other rice cookers that I have had, this one takes a little more time to cook rice, approximately 45 minutes, but you do not have to worry about that with the timer. Thinking very rationally, this rice cooker has an excellent cost-benefit ratio. I do not have any doubts about Zojirushi rice cookers because my family has owned one since 1991 and used it almost every day. Moreover, if you think you will not eat that much rice, remember you can prepare other foods as well. I must say that the NS-ZCC10 is one of the best Zojirushi Rice Cooker I’ve seen on the market.